As different repertoire can demand a higher or lower action and atmospheric conditions can bring about an undesired change in string height, bass players need to be able to adjust string height quickly and easily. Manson bridge adjusters have been developed in collaboration with bass maker and repairer Roger Dawson of London. They have been precision engineered, and are both light and discreetly elegant. The adjuster wheels are made from anodised aluminium which has the appearance of brass but weighs less than brass and will not tarnish. Weighing just 30g per pair, the adjusters have a negligible effect on the mass of the bridge. The anodised aluminium alloy is much tougher than untreated aluminium. 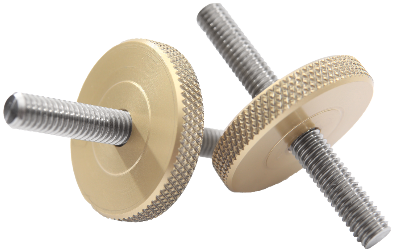 The threads on the wheel and the stainless steel studs are precision engineered to give fine smooth adjustment. Each wheel is gauge tested for optimum thread fit. This care in manufacture ensures the product is free running and durable. The hard surface finish of the aluminium alloy prevents thread binding under pressure, resulting in a long trouble free life. To get Manson bridge adjusters fitted, please contact Roger Dawson in Greenwich (+44 208 6918300) or Laurence Dixon in Clapham (+44 7947 477520). You may also be interested in our bass spike and C-string tuner.